I have a fig tree in my backyard. 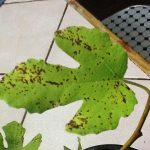 I see orange dots (little balls) on the actual fig fruit, and slight orange coloration of the leaf veins. There are also dried leaf edges, but it may be because I live in Arizona, even though I faithfully water it every other day. I see small white gooey dots (small balls) on the leaves, too. I'm not sure what they are.